can understand the pain of a loved pet - we went thro that painful period when dumb bit left us. It's a real pity there is no garden to bury the poor guy. I think he prob knows his time is up when you put him into the plastic bag. There is a big discussion on euthanasia ( and I think Holland is one of the very few coutnries that permits it ). 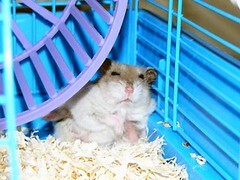 Well, at least you guys have those nice pictures of Hammie to remember by. 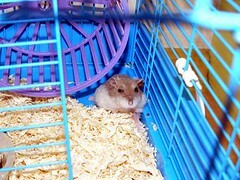 You could write a children's story book on your household's adventure with Hammie. I know it's quite sad, all those sufferings that Rachel put poor Hammie through, but you know, it is rather hilarious as well, the way you accounted the stories. :-) Serious. Wanna write a book for Rachel called "The Adventures of Hammie"?